Eyelash, Boa, Ladder, Ribbon, Fun Fur and Other Speciality Yarns. threads made to look like fur. look rather than fur looking. crazy crossing the country on Fun Scrafs/Boas etc. I am including some links as I find them to free patterns and yarn sources. I traveled during one winter break, Virginia to N.J.
My patient husband drove 99% of the way. or looking for information on them. Since I crochet for a living everyone asked me about them. It was a challenge to find the knitting needles. Now I just go online to joann.com as they carry all sizes. crochet hooks in sizes I did not know existed. seemed even more fun to me. but I am also listing links below to more professional ones. and Bamboo Knitting Needles in size 13. I have been told many people use plastic size 17 and 19. There are the great scarves that some say take only 2 hours. Mine take many extra hours but I love it! I use two or more different yarns from different companies. 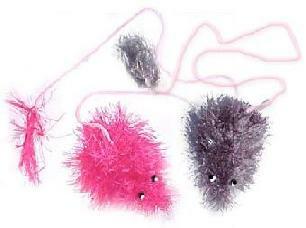 Some look like fur but are called eyelash yarn, boa etc. Lion Brand, Bernat, Straw etc. Some made in Turkey, Taiwan and Italy. Some look like eyelash, others like ribbon, chenille etc. I found that some yarns stick together more when crocheted. I usually prefer to crochet but did enjoy this simple project in knitting. If you know single crochet and simple knit stitch you can make one. I really enjoyed twisting two or more yarns together. Jo-ann Crafts, Ben Franklin, Michaels, A.C. Moore, Walmart and more! Some local yarn stores may even carry a few of the more expensive and more unusual yarns to mix in so check out your local stores too. Online stores for yarns too are carrying these yarns. often make a project more interesting so experiement! If the yarns are sticking together, try a larger hook or needle. using only the fur like yarn or all of the yarns in your pattern. Can't crochet and your ends look rough? Tie ends into a loop to form a ball. Experiment with different sizes of needles or hooks. larger needles or hooks and work faster. I found when crocheting the yarns often stick together more, use large hooks. The plastic Q is great. If you can use smaller, try the rosewood N & P work great too. But be cautious when trying to pull apart for restarting. It is often hard to pull apart the doubled yarns if you crocheted using eyelash yarn. Experiment with mixing two or three different texture yarns. and metallic threads with the fur and eyelash yarns. when knitting with eyelash yarn/fur. My friends are starting to worry about my sanity! I have the urge to trim too many things with fun fur! Willow reed wreaths including Chanukah ones! 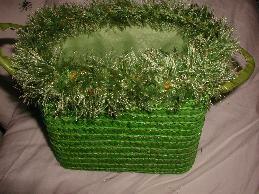 Thick green tweed fur and moda dea yarn with multicolor puffs. Crocheted using pink fancy fur by Lion brand on edge. Crocheting a single crochet through the holes in the straw. Then crocheted a chain to place on top of the ribbon on the middle of the hat. Crochet from the inside out on gloves etc. The fur then will be fuller on the outside of the item. 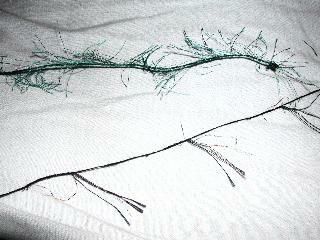 When trimming fabric or straw, use a metal crochet hook. Use the smallest hook you can. This allows you to make a smaller hole in the fabric while still be able to pull the thick fur through. You have to use some strength to poke through a bag or basket that is lined with material but watch out you don't crack the straw! If the straw breaks at the edge, poke lower in the object, the fur usually will cover your mistakes. Watch for interesting items like Dollar Tree Stores and Target, both have great stuff if you have immagination. As with scarves, use multiple yarns. Or mix yarns with cotton, nylon or other crochet thread. Eyelash yarn can be many types of yarns. Top Lion's Fun Fur bottom Single Eyelash. 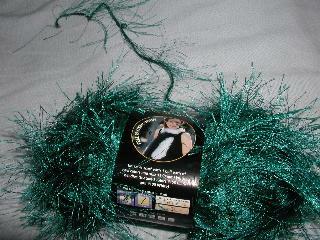 Lion Yarn's - "Fun Fur"
Really interesting when mixed with an eyelash/fur yarn. Make sure colors are different for this yarn to really show up. Ladder yarns as pictured above are made by many companies with more showing up at stores every month. Joann.com Sensations - Willow = Ribbon with extra lumps of soft yarn scattered on the ribbon. Lion Brand - Trellis= Ladder Yarn, Incredible= Wide ribbon yarn. Coats and Clark - Tikki = Ribbon squares on a single thread. Can work up fuzzy if crocheted with a small metal needle. Bernat - Matrix= Ladder yarn. Plymouth yarns = has Eros and other ribbon and ladder yarns. Trendsetter Yarns = have many different eyelash and ladder yarn. 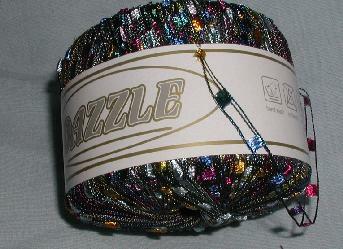 Berroco - Lazer FX and Mirror FX = Have a single strand thread yarn with square or round mirror-like jewels. GeM = Space dyed ribbon, Zodiac= ribbon, Mosaic FX = Ladder, Suede = Suede like ribbon. Also check out Zen and Zodiac. Joann.com - Sensation yarn's Catalina Is a ribbon yarn. As usual with most of my crocheted work and now knitting, I don't stick to a pattern. Actually with these scarves, I do like about a 3" to 4" wide scarf. leaving yarn for an occasional crocheted edge. on the thickness of the yarns I am using. (spelling?) stitch as I liked the ribs to show in the fur. This is done by using the knit stitch (no purls) through out the scarf. For most scarves, this means only between 10 and 13 stitches wide. I have had a friend and some of companies suggest casting on to a circular pair of needles the length you want to avoid all of the turning. But as I do like the ridges, I will stick to regular needles. Most skeins of fun fur will work up to a 48" scarf. Variegated furs are usually less per ball and end up around 42" in length. To see pictures of my finished projects see Chadis Crafts' Scarves page. I decided to offer some for sale for those with no time to learn to knit or to busy to. I found these books by Kathleen Greco inspiring. The books use eyelash yarn and other speciality yarns. They have great descriptions of the different kinds of speciality yarns including the new jelly yarns. 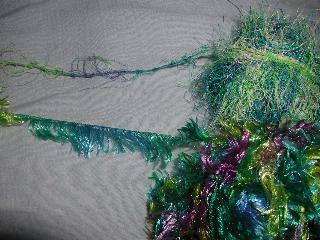 I used them to get an idea for making a scarf using scraps of eyelash yarn left over from other projects. We all have yarn that is too short to even trim a glove. Well she suggests you take them and tie them together leaving a tail of 2 or 3". You make a ball and then knit together with another full ball of yarn. I made a ball the size of a very large grapefruit. I left 5' to 6" tails! Now you can buy books from Amazon.com and support these free craft pages. Crocheting Hawaiian Leis Using Eyelash Yarn. See My Needlecrafts Book list and supply source for information about books about making feather & ribbon leis. Plus books on how to crochet leis using regular yarn. Hint: Check inside the wrappers to the yarn there are often free patterns there too. Check out Moda Dea Yarns and Joann's own Sensation Yarns! They also have free lessons. 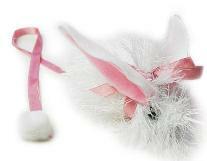 They carry many brands of fun fur/eyelash yarn as well as great ribbon and ladder yarns. They have their own brand, lion brand, bernat, Coats and Clark, Patton and more! I bought a few orders from Joann.com that I now have the free shipping club offer can still use discount codes! I am having fun with the Joann exclusive yarn! I bought Sprinkles and Willow yarn. One is a combination of a ribbon yarn with fuzzy lumps. 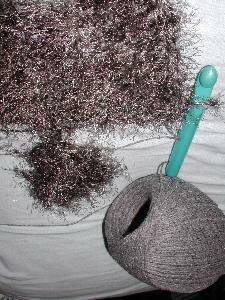 The other is a yarn to mix with others that looks like the fuzzy balls that are added to the Lion Brand Fancy Fur. This way I can mix other plain furs into fancy furs of my own! I did not see these at my local Joann stores at all. 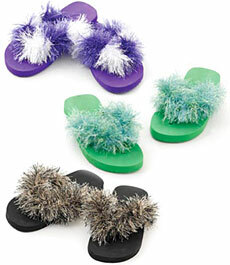 They also have free patterns for crocheting fun fur flip-flops. Can't crochet? Eileen will crochet one for you. For many yarn projects. They now sell eyelash yarn under their own name and a new name. Moda-Dea. Foxy is one of Coats and Clark's eyelash yarn. Moda-Dea yarns has free patterns, just click on the picture on the page I have linked to for a printable sheet like you see in the stores. This is one of the companies selling the "fun fur"/eye lash thread for the scarves that everyone seems to be crazy about. Including me! I have crocheted a few and now knitting one. I have found this yarn in many stores. Available for knitting or crocheting bags, coats, scarfts and more. Free Knitted Chemo Cap Pattern for Fun Fur. Of course it can be used for anyone wanting a fur hat. But for those of us that have had friend's who needed Chemo Caps this is adorable. This comes with two patterns for straight needles or double pointed needles. 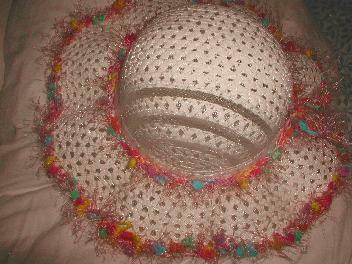 A crocheted chemo cap pattern is also available. They have some fun new things to use eyelash yarn. The flip flops (see above) and some cute pocket pets meant to help teach children to knit and crochet. They also have a newsletter for kids crafts and needlecrafts. 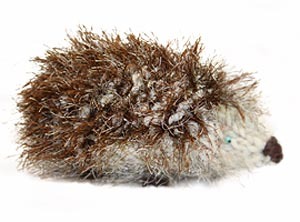 Lion Brand yarn's free pattern for William the Hedgehog. Love their heart shape pillows made of fun fur too. Yarn company that sells Crystal Palace Yarns. Eye lash yarns and more! 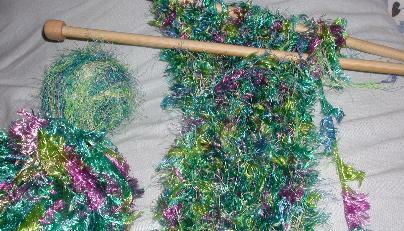 Great yarns for making eyelash scarves . 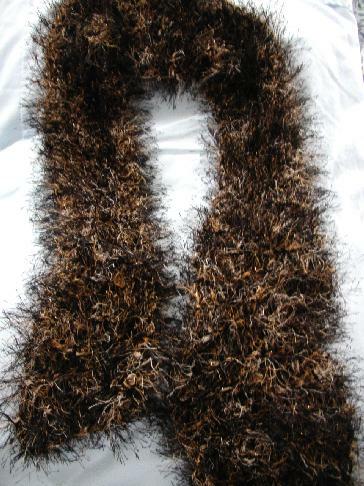 Fuzzy Galore's Scarf plus other free patterns. Bernat yarn also has many different kinds of yarn including eyelash yarn called Boa and Eye Lash. They have free patterns for scarves and other things for crocheting and knitting but you have to sign in as a member to get the full directions. You do have to give personal information to do this. Berroco.com's ( yarn company) free pattern library. Great patterns plus great yarn. Free patterns for Crocheted Easter chicks and felted basket!